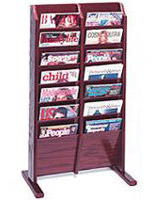 This commercial wood paper sorter is finished in unique red mahogany to really stand out in a high end hotel lobby, office, or retail store. 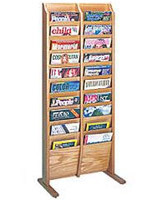 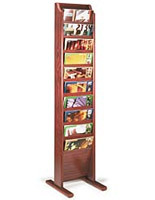 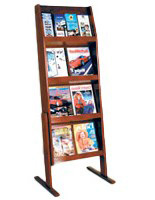 The freestanding dispenser of literature houses catalogs, magazines, and newsletters that customers can read while they wait to talk to a member of staff. 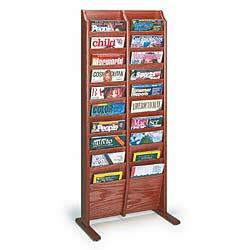 This wood paper sorter, also known as a paper organizer, is floor mounted, which saves more space than countertop mounted versions. 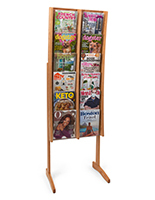 This 20 pocket system features slots sized 9" wide by 3/4" for classic tabloid sizes that are convenient when placed next to a sign directing them toward information personnel. 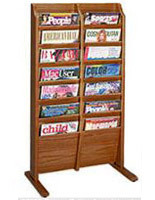 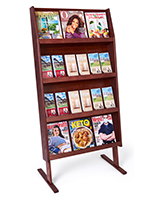 This wood paper sorter that is a magazine racks system comes with feet that get attached using a simple screwdriver for stability in high traffic areas.